Enjoy this exclusive Palazzo Vecchio secret itinerary tour in Florence with an expert English speaking guide from Italy’s Best. The Palazzo Vecchio is one of Florence’s most famous and easily recognizable buildings. Situated in Piazza della Signoria, it still remains Florence’s city hall 700 years after it was built. Throughout the course of its history, Palazzo Vecchio has been the site of many conversations among powerful individuals from the Republic to the Medici era. 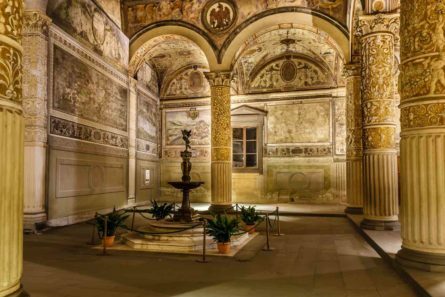 Many an important decision has been made under its roof … too bad its walls can’t talk, but we have the next best thing: a private Palazzo Vecchio secret itinerary tour, exploring spaces where time seems to have stood still! Your private English-speaking guide will explore all of the building’s dark corners with you while bringing its intriguing history to life! You’ll see hidden rooms, secret staircases and more including the Studiolo of Francesco I- brother of the Medici’s Grand Duke Ferdinando I -where he carried out alchemical experiments to turn base metals into gold! This Florence tour for kids takes in everything from the Ponte Vecchio and Piazza della Signoria to the Stibbert Museum, which houses one of the world’s biggest collection of suits of armor. This 4-hour guided tour visits Florence’s Uffizi Gallery, as well as the Accademia Gallery – home of Michelangelo’s David. Learn the social history of the Florentine Renaissance through the eyes of the Medici family, with visits to the Medici Chapel and more. Enjoy this private after hours Vatican tour with an expert Vatican lecturer. You will have access to secret rooms normally closed to the public, as well as 30 minutes of private touring inside the Sistine Chapel to explore Michelangelo’s masterpiece. Designed to capture your child’s imagination, this private Pinocchio Park tour also takes in the fascinating Collodi Butterfly House. During this exclusive visit to a leather school in Florence, learn how to make your own handcrafted leather souvenir to bring home.